&quot;All Things are ready if our minds be so&quot; Explore the dramatic techniques used by Henry V to inspire his men before the battle of Agincourt. "All Things are ready if our minds be so" Explore the dramatic techniques used by Henry V to inspire his men before the battle of Agincourt. William Shakespeare's play "Henry V" is set in 1415, when Henry becomes King Henry V of England. As a young man Henry enjoyed drinking and the company of women. When he became King Henry changed, he wanted to be taken seriously and to be treated like an adult, so he gave up drinking. Henry was angry and insulted by a birthday present of a box of tennis balls from the King of France, Henry thought the King of France was suggesting that he was still a boy and not a man capable of ruling England. To prove he was a man Henry ordered the invasion of France. 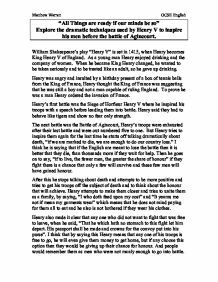 Henry's first battle was the Siege of Horfieur Henry V where he inspired his troops with a speech before leading them into battle. Henry said they had to behave like tigers and show no fear only strength. ...read more. Henry also made it clear that any one who did not want to fight that was free to leave, when he said, "That he which hath no stomach to this fight let him depart. His passport shall be made and crowns for the convoy put into his purse". I think that by saying this Henry means that any one of his troops is free to go, he will even give them money to get home, but if any choose this option then they would be giving up their chance for honour. And people would remember them as men who were not manly enough to go into battle. Henry continues his speech by reminding his troops that, "This day is called the Feast of Crispian", this is a Saint's day that the English would have celebrated with a feast. Henry says that "He that outlives this day and comes safe home. Will stand a-tiptoe when this day is named, And rouse him at the name of Crispian" he is telling his troops that when the celebrate the Feast of Crispian they will always remember the battle and remind themselves by showing their ...read more. Henry goes on to say, "For he today that shed his blood with me. Shall be my brother; be he ne'er so vile", by saying this Henry was ensuring that any of his troops who were injured in the battle would be inspired to keep fighting because Henry would regard them as his brother. Henry ends his speech by saying, "And gentlemen in England, now abed, shall think themselves accursed they were not here, And hold their manhoods cheap whiles any speaks", by say this he is inspiring his troops that they are more manly and should feel honoured to be fighting today as any man in England that had missed the battle and stayed at home would feel ashamed when they heard of the great victory and therefore feel less manly. The battle of Agincourt was a great victory for the Henry's tired English troops, they overcame great odds to win. I feel that Henry used this dramatic speech in the play to motivate and inspire the English troops on to victory against the French by lifting their spirits, promising them great honour, also by making them feel part of his family, almost like brothers fighting side by side and by promising them a battle they would never forget. ...read more. Branagh replicates Olivier's effect with his own fire. It contrasts his hushed pre-battle atmosphere with ferocity and life. The fire here is on a smaller scale and rather than hide the character's emotions, it reveals them for the audience to analyse and interpret. Such a purposeful difference relates directly to the original film styles where Branagh's attempts more emotion and attention in bringing out the individual expression. It seems ironic that he gains so much honour from one mans death when he has led a whole life off of the righteous course, but this is part of the play and shows that one can always repent and come out of if stronger. The reason for this is simply to avoid instilling such thoughts into the British troops. Branagh's version however seems to have a more realistic and grittier tone throughout, all the outtakes from the original film were kept, it stuck firmly to Shakespeare's script and was further exploitative of the depth of Henry's character. It was the time to prove that they could live up to the expectation of their forefathers. Henry says that this was the ground that their fathers fought on "from morn to eve". Henry goes on to tell his soldiers to not "dishonor their mothers". 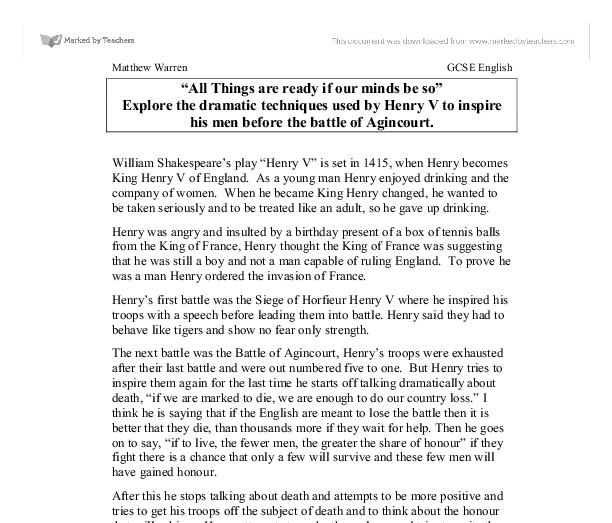 you to use your imagination for King Henry sailing form England to France with a huge army. Act 4's chorus describes the scene in the French and English camps the night before the battle: the quiet night, the burning watch fires, the clank of the knights being suited up in their armour. This adoration of the king by the Archbishop was taken from Holinshed. Obviously because the primary storyline in the play is set around Henry it is only natural that Shakespeare ,through research, would try to find out as much about the king's personality as possible and many aspects of Henry were taken from this. He is depicted as a gallant, courageous and non-aggressive King, yet he invades a defenceless country and kills thousands of innocent people. He also punishes many of his former friends, while he takes no responsibility for the anguish and bloodshed that he has created.